BEWARE of the use of your colorizing pigments. Many of those only take from 1 to 3 drops to get the same blue color I see in your photos. You don’t want to waste pigment by over applying! Can you put the project back on the CNC and do a leveling toolpath to bring down the excess epoxy to the surface of your material? That would definitely have been the smart thing to do, and I even had the jig to do it as this was a two-sided job. I don’t know why I did not think of that… One more thing to add on my list for the next one ! follow-up: I used the machine this time to remove the excess epoxy, and it worked like a charm. 12.000 & 2000mm/min for the surfacing, no glued up endmill, very light fine grain sanding after that, easy enough. Julien, thanks for the view and what you did with this piece. I’m going to have to try that on my next set of coasters as it should be faster than sanding down to a fine finish. I am going to try and mix a clear batch of epoxy and thin it enough to use a sponge brush to apply it, hopefully without air bubbles. 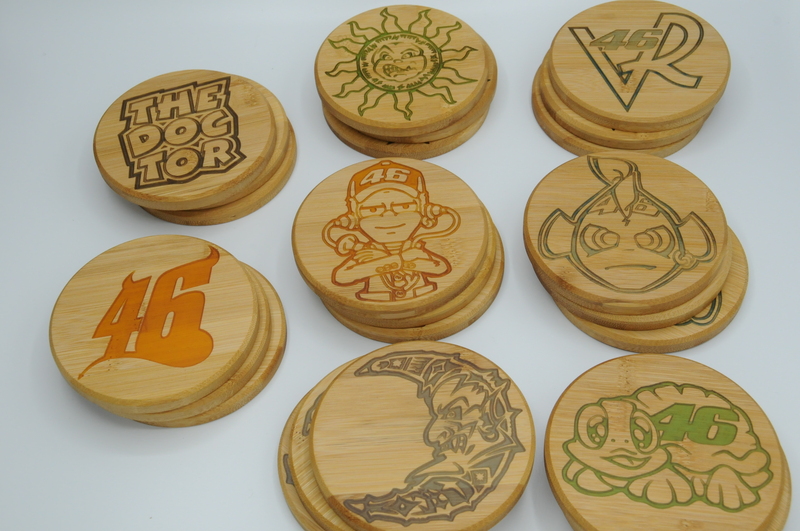 It’s been a busy week-end, but I’m finally done with this series of coasters. 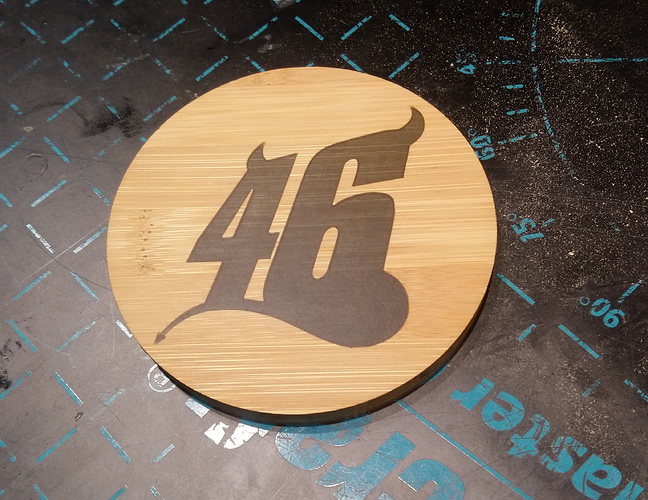 I did three sets of 8 coasters, for friends that happen to be fans of Valentino Rossi. On the plus side, I confirm that bamboo and epoxy love each other. No need for sealer, zero bleeding, it’s almost too easy. Shaved off the excess epoxy with a surfacing operation on the Shapeoko, and now I wonder how I could bear doing it manually before. My only regret/failure is that some of the colors came out very faded, I guess the cheapo coloring thing was not very good quality. But otherwise I’m quite pleased with how they came out. What finish do you use on the bamboo coasters to prevent water rings? I keep coming back to V-carving bamboo and using epoxy inlay. So easy and satisfying. 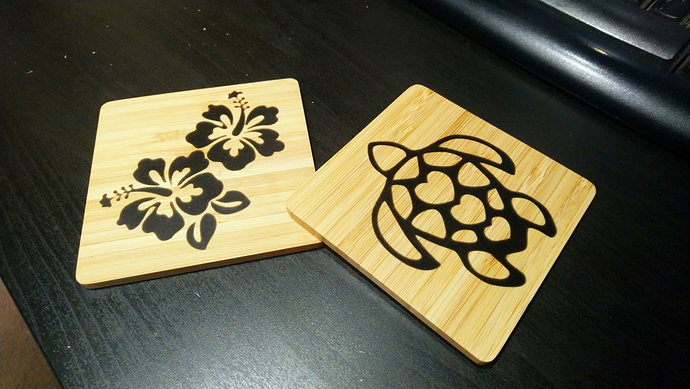 I initially bought this set of coasters during a trip to Hawaii, the flower & turtle were printed (probably in China…) on top, so of course after 6 months it was all gone. 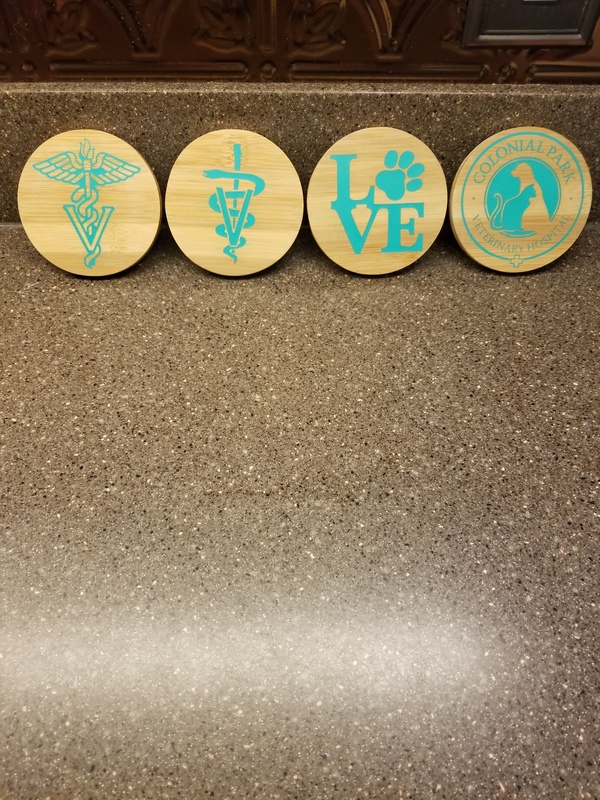 I fired up the Shapeoko, V-carved the first two SVGs I found on google image that looked like the original ones, poured epoxy + black die like a madman, surfaced them, and voilà. Now they’ll last forever. Very nice. Is this Bamboo? Yes, that is bamboo. I love Vcarving it as it requires zero clean up and no primer before pouring the epoxy. I had to have a go at this after seeing how good yours turned out. Thanks for the advice Julien! Nice ! How did you color the resin ? This is the one thing that I still struggle with to get consistent results. Jesse, try using a heat gun or torch to coax the bubbles out. I have found dyes seep into the woodgrain but pigment powders do not. I got a variety pack of colors from Amazon of “Diamond” pigments. The tiniest bit of powder goes a LONG way.